One of the most fascinating gemstones throughout history is alexandrite: a gem variety of the mineral chrysoberyl that actually changes color from blue green in daylight to redish purple in incandescent light. The first time you see it, it is hard to believe your eyes! Gems that show special optical effects are known as phenomenal stones. Alexandrite has a distinguished and glamorous past: it was discovered in 1830 in Czarist Russia. Since the old Russian imperial colors are red and green it was named after Czar Alexander II on the occasion of his coming of age. Alexandrite is also sometimes available as an unset stone but it is extremely rare in fine qualities. The original source in Russia's Ural Mountains has long since closed after producing for only a few decades and only a few stones can be found on the market today. Material with a certificate of Russian origin is still particularly valued by the trade. 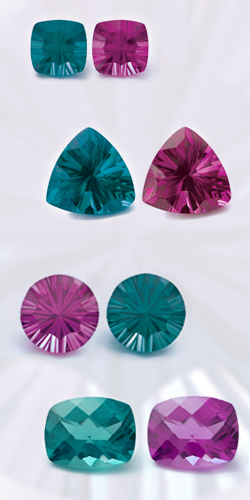 Some alexandrite is found in Sri Lanka and Zimbabwe and Brazil but very little shows a dramatic color change. For many years, alexandrite was almost impossible to find because there was so little available. Lab Created and Lab Grown and Synthetic are synonymous terms. To use any of these terms, according to the Federal Trade Commission, the gemstone must have essentially the same appearance and optical, physical, and chemical properties as the natural material that they represent. To inquire about pricing, shipping rates or any other information you need about Lab Created Alexandrites please email us at sales@andegem.com .